History Highlights: On This Day 17th Jan 1943. - RAF Bomber Command visits the ‘Big City'. 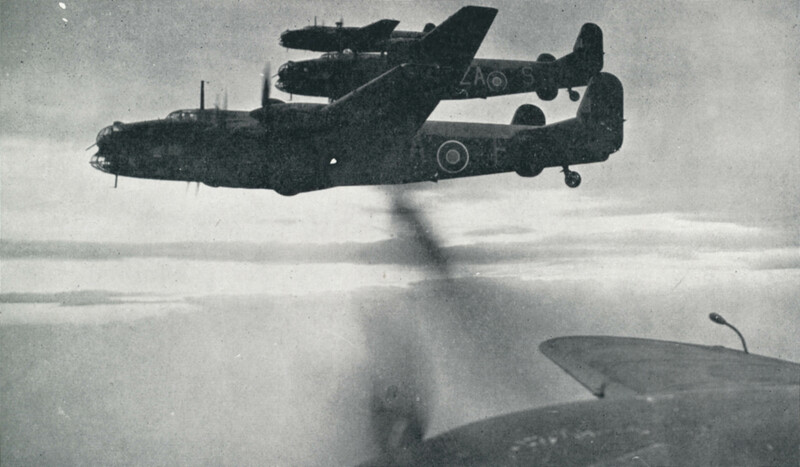 Bomber Command targeted Berlin on the 16th/17th and 17th/18th January for the first attacks on the German capital in over a year. Arthur ‘Bomber’ Harris, commanding Bomber Command, told his men: Tonight you are going to the Big City. You will have the opportunity to light a fire in the belly of the enemy that will burn his black heart out. But it meant that the force of Lancasters and Halifaxs had to fly way out across the north German plains straight into some of the heaviest flak in the Reich. Sergeant Robert Raymond was an American volunteer serving in the RAF. He knew that the ‘tremendous propaganda value’ of hitting Berlin was good for morale. After eight hours sleep following the first raid, when his load included a 4,000 lb ‘blockbuster’ bomb, he went back to do it all over again on the night of 17th. He was well aware of what they were doing and the effect it had – two nights before he had been out on the town when a sneak low level raid by a German bomber had demolished the house opposite the cafe he was in. It had been a narrow escape: Verily it is better to send than to receive in this racket. Then I thought about the message from the Chief of Bomber Command which had been addressed to us tonight and read out at Briefing, ‘Go to it, Chaps and show them the red rose of Lancaster in full bloom.’ Someone behind a desk had given an order to a great organization and here we were a few hours later, one of the pawns in the game, sitting up over the North Sea with the temperature at minus 30° Centigrade, wondering if we would ever see England again. Vapour condensation trails were plainly visible in the clear moon-light above cloud, showing that many other planes were a few minutes ahead on the same track. They are always a curious phenomenon and form at the trailing edge of your wings, due to the decrease in pressure there. Out over the sea we pay no attention to them, but over enemy territory they always result in attacks by night fighters. Conditions over the target were about the same as the previous night, except the visibility was even better. Several members of the crew heard shrapnel from spent bursts bounce off our fuselage and the rear gunner saw five members of a crew bail out and go down on their white silk umbrellas. We passed quite close to them. Flak was more accurate than the previous night and several times I saw the black smoke puffs indicating shell bursts right in front of us as we were leaving the target area. Collected some ice on the return trip, but I have no fear of that now, having studied diligently and knowing why, when and how it occurs. It is only necessary to be able to recognise the type of cloud, the frontal weather conditions and have an accurate thermometer to avoid its cumulative effects. Each time I climbed to lower temperatures or descended to clearer areas and we went through it confidently, although I have reason to believe that it accounted for some that are missing. Impossible to land at base and we were diverted nearly 200 miles, by which time we were running on the fumes that came from the last drops of petrol that Griffiths was squeezing out of the tanks. Came back to base today and found many missing and the rest scattered over England in various ways. More and more I find that knowledge is a more valued asset than courage. Each member of the Crew is still learning. Griffiths has found the best speeds to fly and rates of climb for most economical fuel consumption. We keep our own charts and are improving steadily. Two consecutive nights to Berlin leaves me with but one thought when I have finished this letter. To sleep for at least 12 hours. And my stomach reminds me that I haven’t seen an egg for nearly a month and our food is very poor.